If you’ve been involved in a car crash, particularly a rear-end collision, there is a strong possibility that you may develop symptoms associated with whiplash. Whiplash refers to an injury of the soft tissues of the neck. This injury has the potential to cause long-term symptoms, such as chronic pain. If you do experience neck pain in Geneva, visiting a chiropractor right away can improve your condition and reduce the chances that you’ll develop chronic problems. 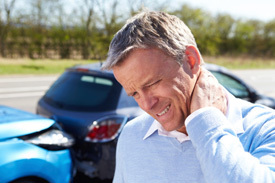 The most common cause of whiplash is an auto accident. Whiplash is particularly prevalent among victims of rear-end collisions. However, other events that involve physical trauma can also lead to significant neck pain. Individuals who play football, hockey, and similar contact sports may develop whiplash after a collision with another player. Whiplash may develop after acts of violence, such as being punched or shaken. For example, shaken baby syndrome can cause whiplash. Whiplash develops when the soft tissues of the neck become stretched beyond their normal capacity. For example, in a rear-end car crash the cervical spine develops an S-shaped curve, rather than its usual C-shaped curve. The lower part of the cervical spine bends backward, while the upper part bends forward. In other words, when a car is struck on the rear bumper, the individual’s head is abruptly forced backward and then forward. These abrupt motions force the ligaments, muscles, nerves, and other tissues to become severely stretched. Whiplash doesn’t only affect the soft tissues. Your chiropractor may determine that the injury has also caused joint dysfunction, which can cause symptoms such as pain and reduced range of motion. It may result in disc herniation, which can lead to nerve irritation that causes symptoms such as shooting pain down the arm, numbness, and muscle weakness. The symptoms of whiplash typically develop within 24 hours after the traumatic event. They may include neck pain and stiffness, loss of range of motion, headaches, and tenderness or pain in the upper back, arms, or shoulders. Some individuals report fatigue and dizziness. Occasionally, whiplash can cause other symptoms that may not appear to be related to the injury, such as blurry vision, ringing in the ears, memory problems, concentration difficulties, depression, irritability, and sleep disturbances.